Canadian Mennonite Board of Colonization, 1935. Back row (l-r): John A. Harder, C. A. DeFehr, G. J. Derksen, Jacob J. Gerbrandt. Front row: B. B. Janz, David Toews, C. F. Klassen, J. J. Thiessen. Source: Centre for MB Studies, Winnipeg: CA CMBS NP108-04-1. When, after World War I, the Mennonites of Russia were famine-stricken and suffered many other hardships, the Mennonites of Western Canada were among those who wished to extend every possible help. Thus, on 18 October 1920, 14 representatives of the various Mennonite churches in Manitoba, Saskatchewan, and Alberta met in Regina, Saskatchewan to organize a Canadian Central Committee similar to the Mennonite Central Committee just organized in the United States. The committee was to be in charge of a united Canadian relief program for the Mennonites who suffered in Russia. 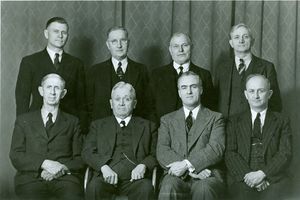 A committee of five was elected: Peter P. Epp, Morden, Manitoba; Abram Loewen, Acme, Alberta; C. K. Unruh, Hepburn, Saskatchewan; P. M. Schmidt, Drake, Saskatchewan; and John Thiessen, Greenfarm, Saskatchewan. This committee elected its executive as follows: P. P. Epp, chairperson; John Thiessen, secretary; and C. K. Unruh, treasurer. Twenty-five conveners were appointed to organize local relief committees and direct the relief work in the Mennonite churches. It was also decided that if at all possible the relief work should be done jointly and in co-operation with the Mennonites in the United States. A little later the Russian Mennonites sent a delegation to investigate immigration and settlement possibilities in Mexico, the United States, and Canada. Of these countries Canada alone finally consented to open its doors to the prospective immigrants. In order to assist in the prospective Mennonite immigration movement to Canada, an organization was effected at a meeting of representatives of the Canadian Central Committee in the home of H. H. Ewert, Gretna, Manitoba on 17 May 1922, under the name of "Canadian Mennonite Board of Colonization," with headquarters in Rosthern, Saskatchewan. A. A. Friesen, who had been one of the four delegates from Russia, was appointed corresponding secretary and later secretary-treasurer of the Board, and David Toews of Rosthern, chairperson. Various representations had already been made to the federal and the western Canada provincial governments in connection with this Mennonite immigrant movement. The Canadian Pacific Railway Company (CPR) was also interviewed with reference to the transportation of the Mennonites from Russia to Canada. Gerhard Ens of Rosthern, who had been a member of the Saskatchewan Legislature, rendered a very valuable service as intermediary between the Mennonite Board and government officials. At his suggestion a joint stock company to finance the immigration and more effectively settle the prospective Mennonite immigrants was planned. This, however, did not materialize due to lack of financial support. On 20 June 1922, Colonel J. S. Dennis, Chief Commissioner of the Department of Colonization and Development of the CPR, advised the Canadian Mennonite Board of Colonization that the CPR was prepared to enter into a contract with the Board to transport 3,000 Mennonites from Russia to Canada on a credit basis. At a meeting of the Board on 26 June 1922, this generous offer was accepted and the chairperson, David Toews, was authorized to sign the contract on behalf of the Board. The co-operating Mennonite groups in this movement were the General Conference Mennonites (GCM), the Mennonite Brethren, the Mennonite Church (MC), the Church of God in Christ Mennonites, and the Evangelical Mennonite Brethren. David Toews consistently stressed the fact that this undertaking was a missionary project based on faith. There was, however, strong opposition by some of the Mennonite communities to the above credit contract and its implications. The first group of the new Mennonite immigrants arrived in Canada in July 1923. Similar contracts were entered into every year up to 1930. Over 21,000 Mennonites were brought to Canada under these contracts. The total credit for transportation extended by the CPR amounted to $1,767,398.68. The last of this principal sum was paid back in 1946. In addition a total sum of $180,000 was paid as interest. The balance of the accrued interest due, amounting to about 1.5 million dollars, was canceled by the CPR, and the interest payment of $180,000 was placed in a suspended account by the CPR to serve as a collateral for a future possible credit movement. Accommodation and maintenance were provided for the newcomers by the Canadian Mennonites who opened their homes to them on their arrival or assisted them in finding necessary accommodation. The Mennonites of the United States also greatly assisted them by sending thousands of pounds of clothing and large sums of money to the Canadian Board for the needy and sick. Many hospital bills and other needs could thus be met and in quite a few cases deportations prevented. They also advanced approximately $250,000 in loans to be applied on the transportation debt, all of which has since been repaid. In order to aid the settling of the newly arrived Mennonites, Colonel Dennis suggested that a Mennonite Land Settlement Board be organized to separate the land settlement work from the work of the Colonization Board. The Land Settlement Board was organized in July 1924. It consisted of nine members; the Canadian Mennonite Board of Colonization, the Mennonite immigrants who now had their own organization known as the Central Mennonite Immigration Committee, and the CPR each had three representatives. The underlying principle in this settlement work was "to settle the largest number of Mennonite immigrants in the best possible way for the least possible expense." The Canada Colonization Association, a subsidiary of the Colonization Department of the CPR financed this work. All commission contracts were made in the name of the Canada Colonization Association as security for the advances made. The commissions received, however, were not sufficient to cover expenses and the Canada Colonization Association later absorbed the Mennonite Land Settlement Board. The Canadian Mennonite Board of Colonization appointed collectors to collect transportation accounts from the immigrants. H. B. Janz served in this capacity for a number of years and was succeeded by C. F. Klassen in the spring of 1930. Klassen continued this work until he went to Europe immediately following World War II in 1945 under the auspices of the Mennonite Central Committee to direct the emigration of Mennonite refugees from Europe. The Canada Colonization Association also financed the expenses in connection with this collection work. David Toews very capably served as chairperson of the Canadian Mennonite Board of Colonization from its inception until failing health forced him to resign on 4 April 1946. J. J. Thiessen of Saskatoon, Saskatchewan was then elected as his successor. Just two months later Daniel P. Enns, who had faithfully and efficiently served as secretary-treasurer of the Board for twenty years, suddenly died. He was succeeded by Jakob Gerbrandt, a member of the Board since before the arrival of the first Mennonite immigrants in 1923. In the period 1930-35, when W. L. Mackenzie King's Liberal Government was replaced by R. B. Bennett's Conservative Party and very adverse economic conditions prevailed throughout the world, further Mennonite immigration to Canada under the above scheme was prohibited. The Mennonites remaining in Russia were in great distress. During the years 1929 to 1938 the amount of $211,218.36 was received by the Canadian Mennonite Board of Colonization for transmission to Russia. A large portion of this sum was contributed by the relatives who were fortunate enough to have come to Canada in the previous decade. By the end of 1950 the above sum for foreign relief purposes had increased to $230,773.43. With the beginning of World War II, remittances were mostly sent to Mennonites in South America and western Europe. In July 1947 the office of the Board was moved from Rosthern to Saskatoon, Saskatchewan. In the same year a new movement of Mennonite refugees to Canada started. The applications of prospective Mennonite immigrants for admission to Canada were largely prepared and then submitted to the Canadian immigration authorities by the Board or its provincial committees. The MCC representatives handled the processing overseas. Between 1947 and 1951, 7,698 Mennonites immigrated to Canada, the majority coming to close relatives. Others were placed on farms as sugar beet workers or general farm workers. Quite a few widows with their children were permitted to come as domestic workers. The above immigration involved an outlay of over one million dollars for transportation charges, most of which was advanced by the close relatives, but the Mennonite Board and the provincial committees also gave considerable assistance. On 24 May 1951, the Canadian Mennonite Board of Colonization signed a contract with the CPR for a new credit movement for the amount of the above-mentioned suspended interest of $180,000. The first group of 48 credit passengers arrived in Canada on 25 July 1951. Most of these were Mennonites from the former Danzig area of Germany who, with a few exceptions, had no relatives in Canada. Repeated representations by the chairperson of the Board, J. J. Thiessen, to the Canadian Government were necessary before the Danzig Mennonites were finally more freely admitted to Canada. The chief participants in the work of the Canadian Mennonite Board of Colonization in the 1950s were the General Conference and the Mennonite Brethren churches in Canada, although a representative of the Mennonite Church (MC) always served on the executive committee. In 1959, the Canadian Mennonite Board of Colonization merged with the Mennonite Central Relief Committee of Western Canada to form the Canadian Mennonite Relief and Immigration Council. This new Council was one of nine inter-Mennonite organizations which formed Mennonite Central Committee (Canada) in December of 1963. See Central Mennonite Immigration Committee. Epp, Frank H. Mennonite Exodus; The Rescue and Resettlement of the Russian Mennonites Since the Communist Revolution. Altona, Manitoba: Published for Canadian Mennonite Relief and Immigration Council by D.W. Friesen, 1962. Gerbrandt, Jacob. "Canadian Mennonite Board of Colonization." Global Anabaptist Mennonite Encyclopedia Online. September 2011. Web. 20 Apr 2019. http://gameo.org/index.php?title=Canadian_Mennonite_Board_of_Colonization&oldid=132346. Gerbrandt, Jacob. (September 2011). Canadian Mennonite Board of Colonization. Global Anabaptist Mennonite Encyclopedia Online. Retrieved 20 April 2019, from http://gameo.org/index.php?title=Canadian_Mennonite_Board_of_Colonization&oldid=132346. Adapted by permission of Herald Press, Harrisonburg, Virginia, from Mennonite Encyclopedia, Vol. 1, pp. 507-508. All rights reserved. This page was last modified on 18 July 2015, at 17:33.